Belated birthday wishes for girlfriend: There are fewer worse ways to make your girl angry than to forget her birthday. It will take a lot of cute greetings, romantic I Love You texts, funny messages, sweet hugs, I am Sorry cards and expensive gifts to get her to forgive you. You are the last person your girlfriend expects to forget her birthday. In fact, most girlfriends hope that their boyfriends will be the first ones to wish them a Happy Birthday. Help your girl get over the heartbreak by pampering and spoiling her for the next few weeks. Bringing a smile back on her face may even require a candid apology on Facebook and Twitter. After all, that’s the least you can do to apologize for being such so stupid and insensitive. 1) Not even my forgetfulness, nothing in this world can keep us apart – because I am your loverboy and you are my sweetheart. Belated happy birthday. 2) Please don’t let one date come in the way of our magical destiny and beautiful fate. I am sorry, belated happy birthday. 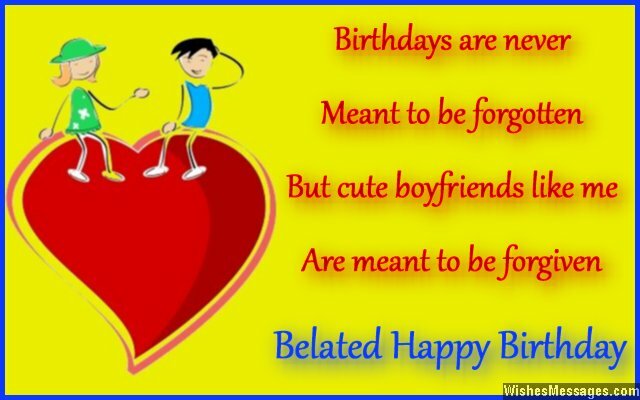 3) Birthdays are never meant to be forgotten but cute boyfriends like me are meant to be forgiven. Belated happy birthday. 4) I am drowning, gasping for air. Your heartbreak, I just can’t bear. I am the culprit, for I forgot your birthday. I hope my belated greetings, make you smile away. 5) True love is when happiness overpowers sadness and forgiveness triumphs over forgetfulness. Since ours is true love, please forgive me, my princess. Belated happy birthday. 6) Soft kisses, tender hugs, cute cuddles, expensive gifts and romantic dates. I will do everything to make up for wishing you late. Happy birthday. 7) I can never turn back time, but I will do everything to show you that you are mine. I love you, belated happy birthday. 8) My girlfriend has all the right to be angry at me for forgetting her birthday. But my girlfriend also has the responsibility to forgive me if she sees that I am repenting and regretting it in a big way. Belated happy birthday. 9) For forgetting my girlfriend’s birthday, I feel like a dirty crook. This is my last tweet tweet and my last post on Facebook. I am taking a wow of silence until my girlfriend gives me that forgiving look. 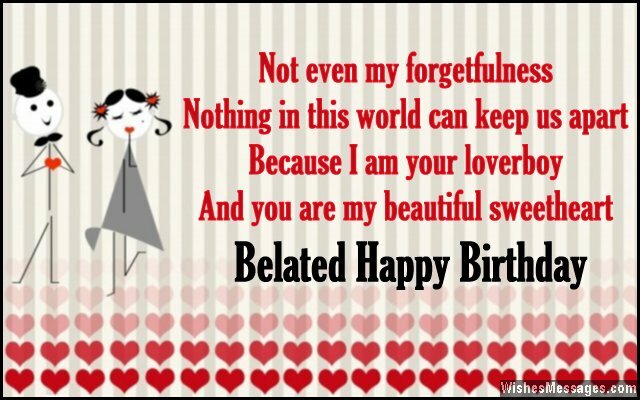 10) A small corner in my heart is happy that I forgot your birthday because it is just another reason I get to cajole you, pamper you, spoil you, hug you and kiss you until you finally break into a smile. Belated happy birthday girl. 11) I forgot your birthday, what can I say. I am sorry miss, please give me a kiss. Belated happy birthday. 12) I can imagine how heartbroken you must be, not to receive a birthday greeting from me. But I want you to image how happy you will be, to receive the most romantic belated birthday treat from me. Happy birthday, sorry. 13) Your birthday came and went, your boyfriend missed the moment. He wants you to know how sorry he is, will you forgive him please? Belated happy birthday. 14) All the wishes you received in greeting cards may be lost in the sands of time. But my wishes for you have been permanently been etched in my heart. Belated happy birthday sweetie. 15) Girl, I am so sorry. Please pick up my calls, I’m beginning to worry. I know I forgot your birthday, I am regretting it in every way. But I know you will forgive me for my forgetfulness, if you give me a chance to show you happiness. Belated happy birthday. 16) Creative peoples like me often forget the most important days. But they also know how to make up for their forgetfulness in the most special ways. Belated happy birthday to the girl who makes my heart sway. 17) I may have a forgetful mind but I also have the largest heart. In short, I may have forgotten your birthday, but my love for you will never run out. Belated happy birthday girl. 18) I may be forgetful but I am not a jerk. I may be late but I am not heartless. Belated happy birthday sweetheart. 19) Damn, I forgot your birthday, I don’t know what to say. Please let me take you out on a nice date, to show that you are the only one in my fate. Please forgive me girl, let’s cuddle and curl. Belated happy birthday. 20) The softest corner in my heart beats for you. The hardest corner in my heart protects you. I know I forgot your birthday, but I truly love you. Belated happy birthday girl, forgive me, won’t you? 21) I could easily blame the tension at work for forgetting your birthday but I will not. All I want to say is that I am sorry and that I love you a lot. Belated happy birthday. 22) I know I have forgotten your birthday but I want to remind you that there is no point dwelling about the past. Wouldn’t you rather think about our beautiful future that lies ahead? Belated happy birthday. 23) Life is all about second chances, and your boyfriend thinks that he should get one too. Belated happy birthday girl, I love you. 24) Slap me if you want, insult me in front of my friends if you like, shame me on Facebook if you think that is what I deserve. Because I forgot your birthday, every punishment I am ready to serve. Belated happy birthday. 25) No one is more beautiful than you. Nothing is as precious as you. I am sorry for hurting you, forgetting your birthday doesn’t mean I don’t love you. Belated happy birthday to you. 26) I just can’t understand how I forgot your special day. But now I will do everything to show how much you mean to me in my special way. Belated happy birthday girl. 27) I may be stupidly forgetful but I am definitely not stupidly insensitive. I know I have hurt you and I will do whatever it takes to see you smile. Belated happy birthday. 28) I know what a big mistake I made and broke my girlfriend’s heart by forgetting her birthday. But I also know that I want to start redeeming myself in every way I can, starting with this lovely bouquet. Belated happy birthday. 29) Even though I forgot my girlfriend’s birthday, nothing can stop me from being the boyfriend I possibly can. I promise to show her that I am capable of being her dream man. Belated happy birthday. 30) For my wishes, I made you wait. But looking at the grand way I will make it up, you will wish that my greetings are always late. Happy birthday. 31) I forgot your birthday and there is nothing I can do now. But if you give me a chance to redeem myself, I promise to make it up to you by giving you a birthday treat which will make you go WOW. Belated happy birthday. 32) I am late but I am here, I will fill the air with cheer. Even though I am greeting you belatedly, I will make sure that we celebrate happily. 33) I don’t know what it will take to make you realize how much I regret forgetting your birthday. But I hope that while I try my best to do so, I will make your heart sway. Belated happy birthday to the girl who makes my heart go YAY. 34) Since the day I forgot your birthday, my heart has split into two. Please forgive me girl, I really love you. Belated happy birthday. 35) By forgetting your birthday I have proved that I am the master of making blunders. But if you give me a chance to make it up to you, I can prove that I am also the master of making amends. Belated happy birthday.